Everyone plays not to lose in Tag (2018), as four friends go to elaborate lengths to finally catch their soon-to-be betrothed and ‘retired’ friend on his wedding weekend. 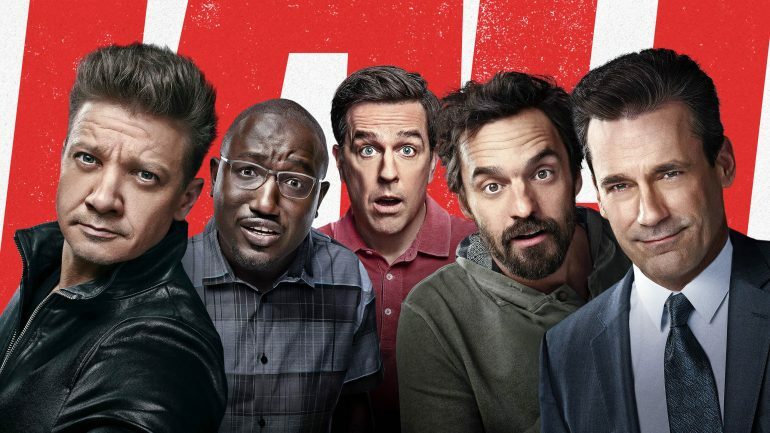 The childhood absurdity is headlined by Hangover veteran Ed Helms, Avengers star Jeremy Renner, Mad Men’s Jon Hamm, Jake Johnson of New Girl, and a deadpan performance by comedian Hannibal Buress. The rated-R film follows Helms, Hamm, Johnson, and Burress in their attempt to satisfactorily end a decades-long game by tagging Renner’s Jerry, who has never been tagged. Obviously, there are no tags-back, and less obviously, no punching allowed in highly specific body regions. The game is only afoot for the month of May each year, and the last person tagged on May 31 has to live with that shame until the next round begins. Renner’s fiancée, played by the delightful Leslie Bibb, adds direly-needed amendments to put their wedding and reception off-limits to the crew’s antics. After all, previous tags have happened at funerals and otherwise heart-warming childbirth moments. There is also an intense performance by Australian actress Isla Fisher as Helm’s wife, who cannot participate in the game because the boys made a “No Girls Allowed” rule when they were nine years old. This might be a good thing, because she happens to be the most willing to commit a war crime banned by the Geneva Conventions to locate Renner’s elusive character. Annabelle Wallis makes an appearance as Rebecca, the curious Wall Street Journal reporter willing to follow the gang across the country after she witnesses the absurd lengths Hoagie goes to in his attempt to tag Jon Hamm’s self-absorbed CEO, Callahan. Rashida Jones easily plays the femme fatale for Johnson and Hamm’s characters, brought in by the cunning Jerry to divide the team. In his directorial debut, Jeff Tomsic asks audiences to suspend their disbelief for an hour and forty minutes in Tag. This includes disbelief over what a spring-loaded tree log could do to a stoned Jake Johnson, the willingness of Rashida Jones to crush on a constantly stoned Jake Johnson, and the limits of adult friendship. Because ultimately, Tag allows us to indulge in one really big and always desirable fantasy: long-lasting commitment. Yes, the film is (very loosely) based on a true story and yes, the actual group of ten friends has gone to incredible lengths to keep the game alive for nearly three decades and counting and yes, some friendships do last forever. But that doesn’t guarantee the game you try to start after watching the film will survive the weekend. And that’s okay. Because most of us cannot take two weeks unpaid leave like Hannibal Buress’ character to play a childhood game. Most of us cannot condone chloroforming our friends to avoid being tagged in said game. And most of us cannot walk away from 20 foot falls without a scratch (just ask Jeremy Renner). All friendships are about is connecting to others on a level that works for everyone involved, and Tag merely demonstrates one of those levels. The film is a worthwhile and cheesy reminder to catch up with old friends, and to keep tradition alive if that tradition means catching up with old friends before it is too late. The characters must eventually address their fears of growing apart and old. It sometimes struggles with this sappier side, but delivers one-liners and action-packed sequences to keep audiences enthralled. Catch Tag at the Spring-Klein Cinemark or AMC Spring 10 this week.